Just before serving, for the topping, beat 1 cup cream on medium speed of an electric mixer until it begins to thicken. Add confectioners’ sugar and whip until stiff peaks form (tips stand straight). Spread the whipped cream over the top of the pie. Using a grater or vegetable peeler, make pieces or shavings of milk chocolate, white chocolate, and semisweet or dark chocolate. 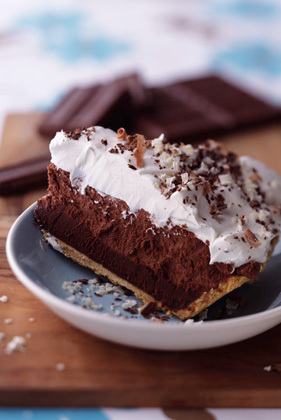 Garnish pie with chocolate pieces. Serve immediately.